Contractor has completed approximately 93% of work on the project. The final lift of HMA is scheduled for the last week of July and first Week of August. This will complete paving operations south of the viaduct. 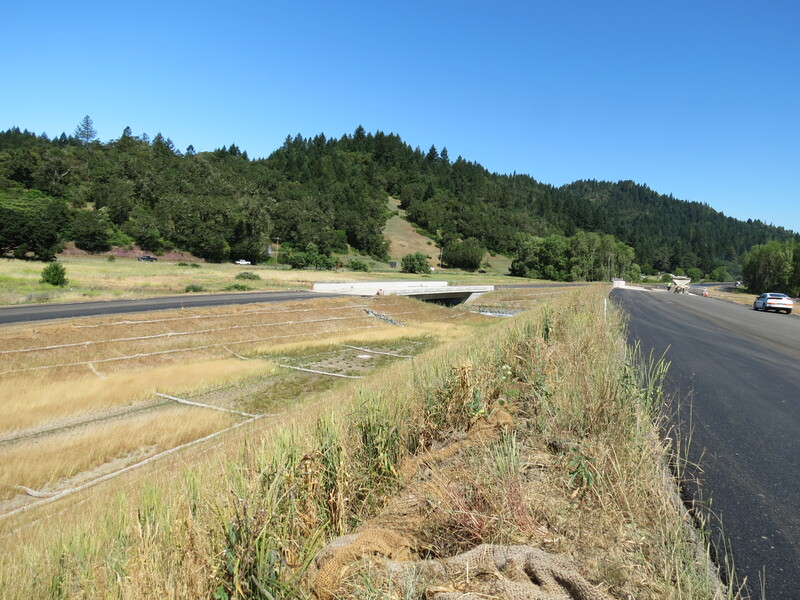 Northbound traffic is currently detoured onto the bypass to the new Hwy 20 exit and back to Willits. This is to facilitate completion of the tie-in for the southern interchange. Traffic will be temporarily switched to the prior detour from time to time to facilitate paving operations. Striping and delineation will follow the final lift of paving. Expected completion by the end of August or early September. All Metal Beam Guard rail is installed. Asphalt dike will be completed following paving operations and is expected to be completed by late August or early September. Electrical facilities for street lighting, message boards and CCTV cameras are currently being installed. Completion is expected in August. Roadway signs are anticipated to be installed by August. Right and left bridges for 101/20 Separations are complete. A1 Retaining Wall and Baechtel Creek Retaining Wall are complete. All Haehl Creek bridges are complete. East Hill Road Undercrossing Bridge is complete. North Haehl Creek Bridge is complete except for deck grinding and joint seals. Permanent erosion control is installed on all slopes. Contractor is working on punchlist items to complete construction. The Floodway Viaduct is complete except for final concrete finishing. Concrete finish work is continuing and will be completed this summer. Drainage systems are complete with the exception of some inlet grate assemblies which are scheduled to be installed as scheduling allows; completion in August. Tie-in detours have begun to allow for final tie-in grading. There will be several traffic configurations to allow for final grading. This work is expected to be completed by early August. Northbound traffic is directed onto the northern interchange and up the northern section of the bypass. This will allow for the construction of the new southbound lane. Currently southbound traffic is on a temporary widening and will remain there until the new southbound lane is constructed. The new southbound lane will be paved in the last week of July. All signs, striping, and delineation are expected to be completed in August. Quail Meadows Overhead and Under Crossing bridges are complete. Approach slab replacement and barrier rail repairs expected take place in early August at Quail Meadows Overhead. Utility relocation work is complete. Upp Creek Main Line, Upp Creek SB off Ramp, and Upp Creek NB on Ramp bridges are complete. Street lighting is functional and currently running on Generator power until the PGE drop is completed. The remainder of electrical services is expected to be complete by end of August or early September. The following is a summary of the construction activities that have been completed up to July 20, 2016. Installation of 147, 645 plants via Contract Change Order in mitigation area (will start in 2016 fall).